Licinia Simão, an Assistant Professor at the University of Coimbra in Portugal and an EDSN Fellow, is hosting an interesting event at the University of Coimbra in the framework of the the EDSN project. 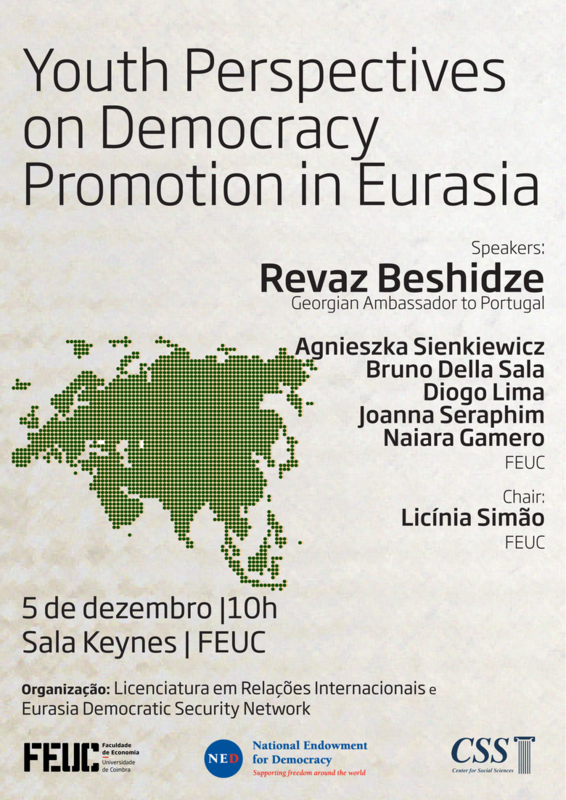 The event, Youth Perspectives on Democracy Promotion in Eurasia, will feature a moderated dialogue among and between international relations students at Coimbra with the participation of Georgian Ambassador to Portgual Revaz Beshidze. This round table brings together the perspectives of young European students and the Georgian Ambassador in Portugal, on the the policies of democracy promotion in Eurasia, since the end of the Soviet Union. Topics including current EU policies towards the region, the role of Russia and the United States, as well as the permanence of separatist conflicts and the ongoing wars of information, among others, are addressed in the discussion. The purpose is to assess the achievements of past and current policies and identify new paths towards the development of cooperative and responsible regional relations. The event is scheduled for 05 December at the University of Coimbra. The discussion will provide an interesting forum for candid discussions of democracy promotion in Eurasia, including considerations of Euro-Atlantic integration as well as key security, political, and economic dynamics in the region. Previous Previous post: POLICY BRIEFING: Does Democracy Still Matter in Georgia?